The beautifully furnished bedrooms of the Lavender and Aquamarine Suite have panoramic views of the Atlantic Ocean and the Twelve Apostles. The bedrooms are sunny and bright with mirrored wardrobes which reflect the sea and have wide sliding patio doors which lead out on to your own private sea facing balcony and a table and chairs where you can sit and enjoy the magnificent sunsets. The Gardinia Studio bedroom is cool, calm and tranquil and is decorated in soft greens to match the beautiful garden which is on your doorstep. Enjoy sundowners on your own private patio surrounded by the birds and lush vegetation and enjoy the peace and tranquility that this beautiful suite offers. Each luxurious bedroom offers air conditioning, a comfortable queen size bed, embroidered linen, dressing gowns, toiletries, satellite TV channel, radio/alarm clock, ceiling fans, safe and hairdryer. The Lavender and Aquamarine Suites each have Victorian styled bathrooms whilst the Cape Rose Suite has a modern styled bathroom with beautiful glass mosaics. All bathrooms are fitted with bath, shower and heated towel rails. 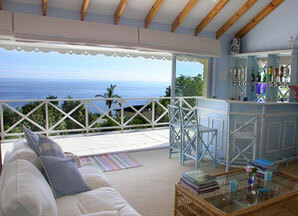 Bed & Breakfast: Enjoy a self serve Continental Breakfast on your own balcony overlooking the Atlantic Ocean. Your kitchenette is fully stocked daily with Breakfast cereals, yoghurt, tea, coffee, milk, sugar, juice, bread, butter, jams and cookies or a delicious continental platter can be served to your suite. Daily Housekeeping. 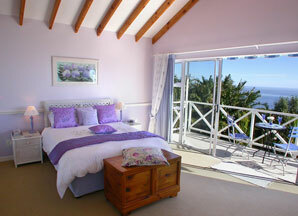 Self Catering: The kitchens are ideal for those light al fresco meals and have quality crockery, cutlery and glassware. Each kitchen is fitted with a Fridge, Microwave, Kettle, Toaster and Sandwich Toaster. Daily Housekeeping. The Lounge which services the Lavender and Aquamarine Suites has breathtaking sea and mountain views and is furnished in beach house style with comfy sofas. It has a small library, Hi Fi and 'honesty' bar where you can sit and relax and enjoy a sundowner or two whilst admiring the spectacular views of the Atlantic Ocean. In season you may even be able to spot whales frolicking in the bay. A braai / barbecue is fitted on the deck for those beautiful balmy days or nights when eating in is preferable and you wish to enjoy the magnificent views and sunsets and the peace and tranquility of the area. 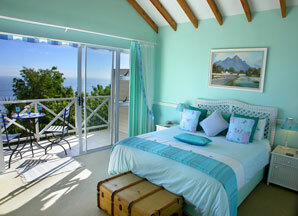 A portable braai / barbecue is available for guests staying in the Cape Rose Suite. A solar heated swimming pool is in the garden for guests who wish to relax and have a refreshing swim on hot sunny days. Safe off street parking is provided and airport transfers and car hire can be arranged on request. Telephone, fax and email facilities are available. We regret no smoking, and no children under the age of 15. Being sold as a 'Going-Concern' and currently operating as a very successful 4 star upmarket guest house, this beautiful 5 bedroomed Cape Cod / Cottage style home is situated in the upmarket suburb of Camps Bay, in a quiet and tranquil neighbourhood with magnificent sea and mountain views. This contemporary home, oozing character and charm with oregon doors, stained glass feature doors and a stunning oregon fireplace with gas fire, is light and bright, beautifully decorated in pristine condition, and is something quite unique in Camps Bay adding to its popularity as guest accommodation. The beautiful gardens front and back attract lots of lovely birds and this adds to the privacy and tranquility of this beautiful guest house. The ground floor accommodation comprises a Lounge, TV room, Dining Room, Conservatory with folding doors that open up to the beautiful garden and swimming pool, a kitchen and separate laundry area, two en suite double bedrooms (one with a fully fitted kitchen offering self catering facilities) and another single bedroom/study with an adjacent bathroom with a claw victorian slipper bath and hand painted rose basin. There are also american style shutters on many of the windows and sliding doors. 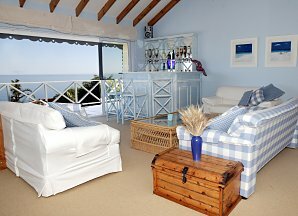 Upstairs there is a large lounge with fitted bar with wide sliding doors opening on to a large deck with spectacular panoramic ocean and mountain views, plus two en suite double bedrooms with magnificent sea views all with fitted glass wardrobes which reflect the sea. The en suite bathrooms have a separate shower as well as beautiful victorian baths and antique oak wash stands with period victorian tiles which match the 'cottagy' theme. There is also a fully fitted kitchen in each of these bedrooms which offers self catering facilities. All four of the double bedrooms have air conditioning and fans and there are also electrical retractible blinds outside the two double bedrooms upstairs which provide shade in the summer months. Attention to detail in this beautiful property is second to none. 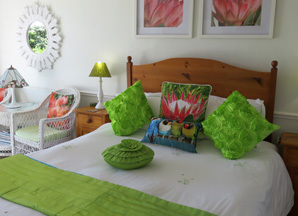 In summary, this guesthouse offers privacy and tranquillity in the busy upmarket suburb of Camps Bay and is currently operating as a Bed & Breakfast with a private separate apartment for the owners and 3 beautifully appointed Suites with additional self-catering facilities.